When I started this blog in January 2013, my wife had only been dead for two months. Looking back I was still deep in shock. In the aftermath of her death I searched for guidance from men in similar situations, but it appeared that young widowed didn’t talk. Yet still I knew that I couldn’t be alone. I felt like I desperately needed to create both an outlet for my grief and a way to find other bereaved men to talk to; launching this blog helped me to achieve both goals. I soon realised, however, that the act of opening up about my grief resonated with all sorts of different people, not just widowed men. So despite the blog’s name I began publishing guest posts from all sorts of different people about all sorts of different loss. At the time, in February 2013, I’d only been grieving my wife’s death for 11 weeks. My grief was raw, my experiences new and I found my feelings changing constantly. I also realised that I was only able to offer one perspective; opening up the blog as a channel for people to share their own stories, however, provided readers with many different insights and lessons learned about grief from people from all different walks of life. A selection of these posts can be found by clicking this link. If you would like to pen a guest post, please contact me directly either via email, Facebook or Twitter. All details can be found on the home page. Please note that I don’t publish commercial guest posts, linked ads or branded content on behalf of agency clients. I also only publish posts about the issues and insights surrounding bereavement and grief. I lost my father 3 days before your dear wife. It was a sudden stroke and brain hemorrhage and he just left us. Totally understand your shock and grief at that time. Now life is getting better for my family and I hope you and Jackson can be strong too. I am so sorry for the loss of your beautiful wife and the mother of your child. You express your feelings so well and I have just read your moving article in the Daily Mail (April issue). Your son is very lucky to have a father like you. When I was eight my parents divorced and I did not see my father for two years after that and subsequently only once a year thereafter. My mother tried to explain as best she could initially but it was never really talked about much after that. I realize now that myself and my siblings would really have benefitted from counseling but there probably wasn’t much of that sort of thing in those days! I grew up finding it hard to trust people and know that things would be ok. I am now a mother of three children ranging from ten years upwards and my kids can come and talk to me about any concerns they have and I am there for them. Its been a healing experience for me. To be able to talk and let feelings out is so important for the emotional development and security of our children. Yours in empathy … Anne. Hi have just seen you on BBC Breakfast, what an amazing man you are. You are an inspiration to those who have and will be suffering a loss. The pain never goes away it lies dormant until something pops into your life to remind you, it can sometimes be the silliest of things. God bless you and your son and keep doing what you are doing. Almost at the end of your book which I pick up and read when times are quite. It is very moving and thought provoking, my daughter wants to read it when I have finished. It is 6 wks since my husband died. Some days it feels like a life time ago and others as if he had gone only moments ago. La la la la …Gaga died and gone to lib in heabens house. When I hear her sing it only makes me smile as I know my husband would have found it funny. Oh how I miss him. I’m so sorry to hear that, Carol. I immediately asked myself how you were able to read it so soon, but then realised I did the same as you and read everything I could to try to get my head round everything. It’s so hard. I wish you all the best in getting through this dreadful time, though. Hello Ben, I have read your book and identified with so much of what you and your son have experienced. My husband died by suicide three years ago leaving me with two boys who were then 4 and 19 months. I have also written a book about our personal experience and the stigma that comes with a bereavement by suicide. I have not published my work and am ambivalent about creating public exposure for my sons and I. I was wondering how that has been for you and whether it has been therapeutic? You are obviously helping a huge amount of other bereaved people but has your openness been helpful to you. I hope so and respect what you have done. Hi Michele. Thanks for reading it and for getting in touch. I’d say the answer to your question, much like grief, changes all the time. My wife’s death left a huge void in my life, which I now realise I filled with activities that somehow tried to honour her life: blogging, writing, running, raising my son the best way I could. But each has presented challenges and exhaustion. Being honest has helped me enormously. It has helped people to be able to offer the right kind of support. Being open has also created a certain amount of pressure and the last few weeks have been really quite tough. It’s been part of my process, though. I don’t regret anything I’ve done but I have spent the last few days wondering if I’d put myself through all this a few years down the line. Dear Ben, Speaking as a fellow writer researching and writing a book on bereavement and studying counselling I truly salute you. But speaking as an adult who lost her Father age seven through a sudden death (a cerebral haemorrhage) I salute you far more. Words cannot express the admiration I have for the fantastic way you have handled the tragic loss of your beautiful wife and choosing to channel your grief into positive activities. My own mother was left widowed young with five children and in those days there was no support thankfully she too was amazing and put her own grief on hold as she became both mother and father. What you have done to help others by your blog (especially men) is truly commendable. Having reached page 166 of your book I apologise for ‘praising you’ but could not read another page without establishing contact. Sharing our experiences honestly helps others in their journey and I recall my own mother saying how people crossed the road to avoid talking to her which was of course no help what so ever. Writing is of course therapeutic and when I ran a writers group I encouraged this especially poetry. I have used emotive works to touch others and fund raise for charities and hospices and I loved your poem to your son. He is indeed a lucky boy who will grow up being loved and understanding the true meaning of living a day at a time and making it count. Death does not end a relationship and we keep those we love alive in our hearts. I wish you continued courage and sending a spiritual hug to you both. I am 33 and on April 9th 2014 my wife Rachel a mother of two died from liver and kidney failure due to years of alcohol abuse. Rachel had a very troubled childhood and shortly after we were married her mom died from cancer. After her mom passed she drank heavily and could not stop even though I desperately tried to get her to and after 5 years of around the clock drinking her body could take no more. She survived 4 weeks on the ICU before I had to explain to her that everything the doctors are doing just isn’t working and she decided to go to hospice and a week later she took her last breath as I watched. It’s been a very tough past few months for me and my children. Rachel was my best friend and so much a part of who I was. We shared a relationship that was based on unconditional love and I failed to protect her from herself and her addiction. I now am left a single father of two and I know that I must be strong for my children despite the great sorrow that overcomes me constantly. My gf just left me half month ago. Now there is a big hole in my heart and soul. I wish to gain a little courage with your story. Thank you anyway. God bless you! I too am now alone, I lost my darling daughter Cheryl in 20 th Oct 2008 from a massive heart attack.My treasured wife Marion was my rock through my desparate sad times ,and now my beautifull Marion too has gone to heaven on 21 st Oct just past.My nights are filled with despair, my lovely Marion only went to hospital with a Gall Stone, and now she lies beside my beautifull daughter..
A friend’s sister recently lost her life, suddenly in her late 30s, leaving behind her loving husband and beautiful young daughter. I came across your blog while looking for ways to comfort them. Thank you for your site. I will probably never meet you and probably would have never met your beautiful wife, but reading “our story” brought tears to my eyes. I am so sorry and cannot imagine the depth of the loss you and Jackson have suffered. I don’t have a way to make it better, but I wish I did. I care about you, and I’m sorry. I am a stranger who will probably never have another interaction with you, but I care, and I’ll be thinking about Desreen. I hope the holiday season is as bright as possible. May it be filled with love and laughter and great memories. It is Christmas Eve and it is with intense sadness I read your blog via Facebook. A friend posted a link to your page and I recognised Desreen straight away. I just felt compelled to write a little something to you. I first met Desreen in year 7 history class under enforced alphabetical seating plan and common surname. I would enevitably lend her my new all in one pen/eraser and end up with her old defunct one to take home. Needless to say Des was in what I saw as the ‘cool group’, everything I wanted to be but wasn’t….loud, funny, confident etc. I just wanted you to know that I will always remember her with a smile. Jackson is going to grow up to be the best of men with a father like you. I have just finished reading your book which is truly inspiring with your openness and honesty! It resonates on so many levels despite different circumstances. I lost my dad in car accident 25 years ago when I was 7 and still love, miss and talk to him often. I take comfort in the memories in have and was listening to one of his favourite albums, Paul Simon’s Graceland’s just the other day! I am currently I going through a divorce and so i am a newly single parent to a fantastic 4 year old but your book has also helped in many ways to understand some of her behaviours – I too am her human punch bag and I never considered it too be because she knows she can trust me not to stop loving or leave her and will not look at it in the same way again! With my gran having also just been diagnosed with terminal cancer I am gearing up to face loss and grief again but who knows when it will actually come and whilst having her ‘life sentence’ as she describes it over her head she is constantly worrying just as much about me and my situation as I am about hers which only leads to me feeling guilty! Its such a mix of emotions and many days all feels fine but then others the smallest thing happens and it hits you like a steam train from all angles. Thanks for sharing your story and helping so many and I hope it has also helped you and your gorgeous little boy… I’m sure your wife is looking down and would be very proud!! I’ve never felt the need to write to anyone after reading about them but your situation has really resonated with me. We are of similar ages and I too have a child but much younger, only 6 months old. That’s were the similarities end I think. I have not experienced the devastating loss that you have and therefore can’t even begin to imagine your situation. Before reading your article in today’s Times, I was a little down in the dumps as I am missing my first Father’s Day due to a military deployment in the Middle East. Your story has brought things into perspective for me. On the grand scheme of things it really doesn’t matter. I will be home a few weeks later and see my wife and child. It was a shock to the system when my little one came along. As you will know, there is no manual for kids and there certainly isn’t a manual for someone in your situation. Essentially, the point of this corispondance is to say it looks like you are doing an excellent job at raising your boy. Keep up the good work and enjoy Father’s Day. Thanks Guy. That’s really kind of you. ich bin Yvonne.52 Jahre alt und verlor am 1.01.2015 zusammen mit meinem Mann Joachim ,mein Leben. Gewiss kann man Trauer nicht vergleichen, aber die leere die entsteht ist gleich. Ich habe mir Ihr Buch gekauft mit der Hoffnung etwas zu finden was Sinn macht…etwas was mir Kraft gibt…etwas mit dem ich mich identifizieren könnte. Leider bin ich noch nicht bereit…habe auf der Seite 34 aufhören müssen…bin dennoch dankbar das Buch einfach nur in den Händen zu halten …es auf meinem Nachtisch zu wissen. in der zweite Woche des anderen Lebens trug ich in mir den Gedanken unsere Liebesgeschichte aufzuschreiben um das Einzigartiges was wir erlebt haben für immer und vor allem für unsere beiden Jungs festzuhalten. Mein Achim und ich…das ist eine Sandkasten Liebe…eine Kinderliebe die erwachsen wurde und alt hätte werden sollen. Leider geht nicht mal das im Moment. Ich schreibe viel denn das hält mich fest ,es sind aber eher Gedichte und kurze Versen. Surely it should be every three years for everyone. How many drive their cars which are “broken” because their indicators do not work. How many are ignorant of the current Highway Code. How many ignore the speed limits. How many use a phone whilst driving. Been there lost my wife in a car accident and am currently raising 2 young boys. thanks for your comment, I am in a similar situation. I have lost my husband to cancer in September 2014 and our children were 2 years 1 month and 8 months old. It is harder than anyone who hasn’t been through it can imagine. I stumbled across your story in today’s Guardian and then Googled your name and read other articles, notably one in the Daily Mail. At the end of it all I sat here in a hotel in Antananarivo with tears streaming down my face. You are one very special individual but I think you were very, very fortunate in your wife. She’s safe and so are you. I lived few houses from where the accident happened. I can still hear it. I have you and your little boy in my thought, admiring you and how strong you are. I know, you have to be. 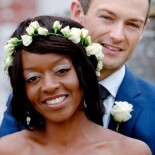 My wife Rachel died after she was hit by a car while out jogging on Saturday. We have 3 sons aged 4, 6 and 8. We had a very happy marriage and she was an amazing mum. I don’t know how I am going to get through. Ben. I lost my wife just over 12 months ago, after 7 years of living with Breast Cancer. I have three kids of 12,14 and 17 – having watched the trailer with yourself and Rio, the comments about wedding rings resonanted so strongly for me. Everyone says how brilliantly I and the kids are coping, but I’m crying as I write this note and looking at wedding ring. I don’t want to move on, I want my wife! Continue the wonderful work and I look forward, and at the same time I don’t (because I suspect it will really upset me) to full program tomorrow. Hi Craig. I’m so sorry to hear that. You’ll see a group of us chatting on the programme tomorrow. We’re part of a larger private Facebook community if you ever want to join. Hi there Ben, like many I found your page from Rio’s programme, Very Inspiring. I found myself as a #MAD in August 2010 when my wife and daughter where killed . I just lost my wife on the 27th of she was only 26 and we had only been married 7 years, July, looking for help or a connection I stumbled on to you and your blog… my wife was killed by a drunk driver instantly 1 minute from our home, she had my 2 year old son in the car, he suffered a brain injury and he’s slowly coming back, having to teach him to talk and walk again is heartbreaking, not sure if he remembers her but it’s so hard to look at him and think he feels empty or can’t express his emotion for his mother! Your story brought me to tears and I feel the same, your many years past me but I’m sure the pain never gets easier we just learn to coexist with it! I look forward to getting your book and I’d love to reach out to you! This blog has helped me so thank you for that.